Mookie Betts rode a career 2018 to reach rarified Mike Trout territory atop Fantasy drafts. Here are 11 other players who could make a similar move. There's a pretty strong consensus around the top three players in Fantasy this season, and it's Mike Trout, Mookie Betts and Jose Ramirez in some order. And really, the only only controversy is whether you should take Betts at the top, or go with the default pick in Trout. Beyond that, this is pretty rarified air, a two- or three-man tier unto itself. But it doesn't have to be that way. This time a year ago, few had Betts pegged for the kind of bounce-back season he put together, and fewer still had Ramirez making the leap to superstardom he made. Trout is going to be a fixture at the top of draft boards until his skill set declines or he decides to quit baseball to take up solo free climbing or deep sea fishing — or just takes up a job as a weatherman. The picks around him, however, tend to fluctuate from one year to the next. What you want is to identify the players who, like Betts and Ramirez last year, have the skills to make that leap into the top tier. You want guys who have at least one truly elite skill, and preferably can steal some bases. The latter is less important in H2H points leagues, but it's pretty much impossible to be a contender for the No. 1 spot in Rotisserie without stealing at least a few bases. Let's take a look at this year's best candidates. I'll offer a roadmap of how they might get there, and some thoughts on what the chances of it happening are. What makes Acuña so enticing is that we've already seen what it would look like for him to be a contender for the No. 1 spot. Upon his return to the lineup in late June, Acuna hit .304/.380/.589 with a 42-homer, 28-steal pace. Just do that again, and he might surpass Trout as the top overall pick. After all, Trout was the player Acuña was most compared to coming up as a prospect. Standing in his way: Will the Braves let him run? Acuña ran at a 31-steal pace when batting leadoff, but was on pace for just seven steals from every other spot in the lineup. It was just 42 starts, so we can't take too much from that, but the Braves have historically been reticent to let anyone but the leadoff hitter run, and Acuña is set to open the season as the team's cleanup hitter. RBI opportunities should be plentiful, but if he isn't a threat to steal more than 15 bases, Acuña's path to a top-three pick gets a lot more treacherous. When a .271-103-19-73-43 season is viewed as a disappointment, you're a rare kind of Fantasy player. Turner was second in the league in steals in 2018, but we were hoping for 55-plus, at least, so his 43 came up well short of expectations. The good news? Turner has averaged 56 steals per 162 games in his MLB career, and Dave Martinez wants Turner to attempt 75-80 steals in 2019. Standing in his way: Turner is coming off a down year at batting average, and he hasn't been a high-BABIP guy outside of his first brief season. If he's a .270 hitter and regresses to 15 or so homers, things get a bit hairy. The floor is super high -- he was the No. 17 hitter last season -- but he does need to go back to his 2017 steal and average pace, while keeping the power he showed in 2018. Last year's main competition to Trout at the top, Altuve's down season still saw him hit .316, but his power and speed numbers regressed while he dealt with a knee injury. If he's healthy and can return to his 2016/17 ways, when he was perennially leading the league in average while hitting 20-plus homers and stealing 30 bases, he's going to be right there at the top of the draft in 2019. Standing in his way: Was Altuve's reduced speed the sole result of the knee injury, or is that becoming less a part of his game? He's still just 28 -- he turns 29 in early May -- but we've already seen him run less in recent years. Every stolen base he loses makes his margin for error that much thinner. Over the past four years, we've seen Harper turn in a truly elite, top-two performance in 2015; one disappointing season where he tried to play through some kind of upper body injury; a 2017 that was putting him back in the discussion for No. 1 overall (.319-128-39-118-6 pace) before an injury limited him to 111 games; and then a 2018 where he just couldn't get anything to drop in for hits. We know what the upside is, we also don't know when or if to expect it. Standing in his way: Himself? Harper signed late in spring training and is off to a miserable start in spring training. That isn't necessarily indicative of anything, but it wouldn't be a shock to see him get off to a slow start. Philadelphia is a fantastic place to hit, but if teams really figured out the best way to shift him in 2018, the average just may not come back to where we want it to be. Blackmon was right there with Altuve at the top of the rankings after his incredible 2017, and like Trea Turner, it's not like his down 2018 was actually bad -- you'll take .291-119-29-70-12 at his current ADP and never lose a wink of sleep. The question is, was 2018 the fluke, or was 2017? Standing in his way: Blackmon's defense seemed to take a massive step back last season, and the Rockies are finally moving him off center field this season. That is a sign of decreasing athleticism, and it's something we saw happen with Andrew McCutchen right when he dropped from the ranks of the Fantasy elite. Blackmon's floor is high in Colorado, but the upside may not be there on the cusp of his 33rd birthday. I'm starting to think Judge might be underrated. He was on pace for a .285-115-43-100-10 season before a hit-by-pitch cost him nearly two months of action late last season. He put together a top-five season in 2017 and was on his way to something close to that before his injury. The upside is still substantial, especially with Judge looking like a 10-steal guy. And that's without asking a truly terrifying question: What if Judge pulls a 2017 Giancarlo Stanton and cuts his strikeout rate for a year? Standing in his way: There's still plenty of room for a truly abysmal season, like we've seen from guys like Chris Davis or Ryan Howard in the past. Judge hits the ball incredibly, almost unbelievably, hard, but the margin for error is slim given how much swing-and-miss he has in his game. A repeat of 2018 gets Baez into the first round, and all it took for him to make that leap was some small tweaks to his contact rate. Baez was still one of the freest swingers in the game in 2018, but he improved just enough to let his prodigious power play up. If he can take another step forward, is a 40-homers, 25-steal season out of the question? It shouldn't be -- he had a 37-homer, 20-steal season in 130 minor-league games in 2013. Standing in his way: His inability to identify a pitch he thinks he can't hit. Baez is a terrific bad-ball hitter, but that's a tough way to make a living. The margin for error is slim. Bellinger made some real strides in 2018, despite the disappointing results, most notably with his plate discipline, as he cut his strikeout rate to 23.9 percent and bumped his contact rate up to 72.4 percent. If he can take those gains and combine them with 2017's powder production, we're talking about a potential 40-homer guy with a helpful average, and potentially 15-plus steals. Standing in his way: Of course, it also looks like he made some real tradeoffs to get those gains in plate discipline. He made weaker contact and popped up at an alarming rate. What if he can't marry his 2017 power with his new plate discipline? And now we're getting to the true long shots. Mondesi played 75 games last season, so let's just double that and see what we get: .276-94-28-74-62. Yep, that'll put him in contention for the top overall spot. The Royals have built their team around speed, and that indicates that Mondesi should have a lot of leeway on the bases. If he remains as aggressive as he was, there is truly elite speed potential, and the bat has shown increased pop over the past two seasons, too. Standing in his way: Oh, so very, very much. He strikes out way too much. He barely walks. We've barely seen him run as aggressively as he did late last season. There's a real chance you're looking at a .240 hitter, with an on-base percentage that might even embarrass Billy Hamilton. Even the Royals may not be able to stomach that from their leadoff hitter. If all Correa does is replicate his 2017 over 150 games, that would be enough. His 150-game pace in 2017 would have left him with .315-122-36-125-3, a truly absurd season. The counting stats will be elite because of the lineup he's in, and Correa has absolutely shown the ability to hit like an elite player. He didn't last season, but an offseason spent recovering from a back injury -- plus a procedure to fix a deviated septum -- could get him back on track. Standing in his way: Correa has just five stolen bases over the past two seasons, a far cry from where we expected him to be. We've seen with someone like Manny Machado whose stolen bases can fluctuate a ton from year to year, but if Correa isn't running, he's going to need to be a .320 hitter with 35 homers to reach these highs. And he's only done that once. If you're not going to steal bases, you'd better be an historically good hitter if you want to be a top-three Fantasy pick. Soto is already an historically good hitter. His age-19 season is basically unmatched in MLB history, and he spent most of 2019 looking like a young Albert Pujols. Soto has "best-in-league" potential as a hitter, with a full-season pace of .292-108-31-98-7. 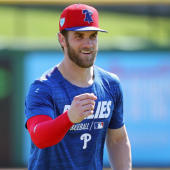 If he takes a step forward as a 20-year-old — because it cannot be said enough that he was 19 last year — you're looking at a potential Fantasy superstar, one capable of challenging for batting titles, hitting 35-plus homers, racking up gigantic RBI and run numbers, and even stealing 10 or so bases. Standing in his way: Progress isn't linear. Soto might be expected to take a step forward in his age-20 season, but there's no guarantee it happens. Just ask Matt Olson or Rhys Hoskins. Or fire up Justin Upton's Baseball Reference page. Young players are inherently risky, and they often disappoint.